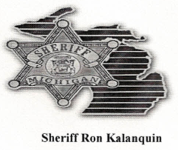 On Thursday 09-12-2013 at 2:43 AM, Lapeer County Sheriff’s Deputies and Imlay City Police Officer’s responded to a house fire on Black Corners Road near Clear Lake Road in Imlay City (Lapeer County’s Goodland Township). Information was received that there were occupants trapped within the residence. The residence consisted of 1 ½ levels. A 17 year old escaped to the residence’s roof and was rescued utilizing a ladder. A 23 year old was able to successfully escape the residence. The fire increased intensity and eventually consumed the structure. Once the fire was extinguished, the father of the 17 and 23 year old being RICARDO RINCONENO age 52 years old from Imlay City was discovered deceased within the residence. Imlay City Fire Department, Goodland Township Fire Department, North Branch Fire Department, Attica Township Fire Department, Arcadia Township Fire Department, and Brown City Fire Department responded to extinguish the fire. The structure fire was under control around 4:39 AM. The Michigan State Police Fire Investigation Unit responded. State Police Fire Investigator Sgt. Lenny Jaskulka stated that the fire appeared to originate within the kitchen and is associated to the stove. Foul play is not suspected and this fatal fire remains under investigation by the Lapeer County Sheriff’s Office.